When I first became Editor in Chief of Marvel, George Roussos was the “cover colorist.” His office was a tiny, ugly little room at the 575 Mad Ave HQ with no natural light, way in the back near “Stan’s Closet,” which deserves a post of its own sometime soon. After early struggles, we turned around the plunge into the abyss I inherited and Marvel started to succeed. Sales were good. We expanded. We had to hire more editors. I needed George’s room, however crummy, for editorial types. Aha! The perfect solution presented itself. There was a big, well-lit, corner office that, as I recall, had only two occupants, graphic designers, Davida and Nora. Lots of room. Natural light. Quiet co-workers. Perfect, one would think, for a colorist. I moved George to the “good” room and installed new magazine editor Lynn Graeme in George’s old room. Natural light, I figured, was less important for her and her assistant. George, the good soldier type did as ordered. But he seemed unhappy. Production manager Danny Crespi clued me in. George had grown up in an orphanage. He’d never had his own space, never had any privacy at all growing up. He hated being in a room with other people. Nothing against them, but he cherished being alone. Not too long thereafter, Marvel moved to custom-made offices at 387 Park Avenue South. I had some influence (not enough!) on the design. One thing I noticed in the original design was that the architect had put George in the bullpen, with lots of people around him. I objected. 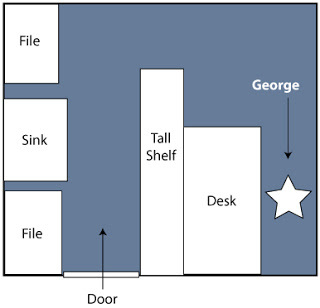 I suggested that we take the planned closet next to the Stat Room and make it George’s office. The architect and others involved, financial officer and, for all intents and purposes, operations V.P., Barry Kaplan argued that A) it was a closet! It was tiny! And B) I was insane. I conceded “B,” but pointed out that, because the closet was next to the stat room, which required water, there was no reason it couldn’t have a sink! Vital to a colorist. And I assured them that George would be happy there. We moved in. George was pleased with his new “office.” He actually made it smaller, sort of. He put his art table in one corner, walled himself off with tall filing cabinets, kept the lights off except for the desk lamp over his table and was happy as a clam. Not a day went by that George didn’t thank me for his office. MONDAY: I Don’t Know! I’ll Come Up With Something! The story of STAR Comics, Marvel Books and various dealings including the Masters of the Universe comics we did is coming soon. Offhand, I don't remember if we did the in-packs for Mattel. 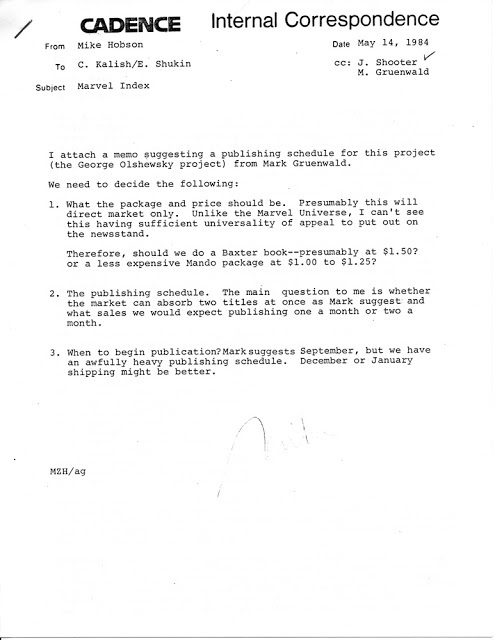 Marvel was usually paid to do entertainment development for toys. The licenses sometimes were part of those deals, and usually on good terms for us. Because G.I. Joe and Transformers succeeded so well, upstairs was always pushing me to do toy-related books, hoping for another grand slam. DC did a few tie-ins, but most toy companies came to Marvel first. I remember George very well from my days at Marvel, first during my time as a Raider and then in the years spent haunting my friends in the Bullpen. When I knew him, George had been moved out into the Bullpen, and was stationed at a desk across from what used to be his "office," out in the general Bullpen madness. I had no idea he disliked crowds, but in retrospect, it makes sense. 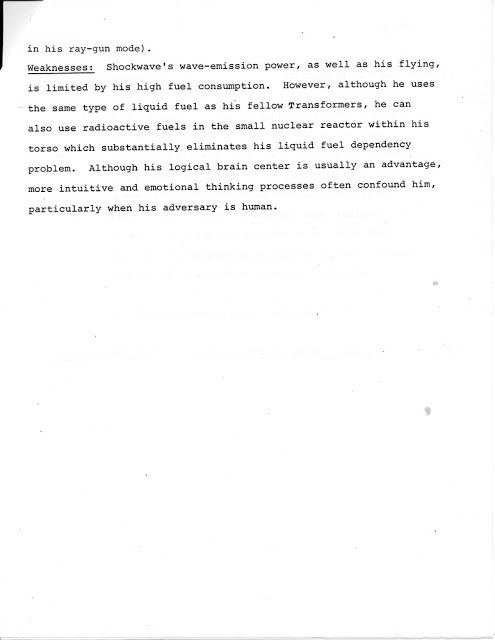 I knew him, but had very little contact with him, as he preferred to sit quietly and do his work. Once, I was dropping off work and was shooting the breeze with an editor and some of the staff in the Bullpen when I heard shouting off to my right. I remember continuing for a minute more in my conversation but the yelling grew louder. Well, the Bullpen was a rowdy place when I was there, so I was used to the generalized hum of vocalized stress, but it was a persistent yelling, so at some point, I turned – and found out it was George! And it took me a full second longer to realize not only was it was George, who was usually as quite as a church mouse, but it was George – yelling at me! Whenever there are times I become concerned that I have spoken at length with no apparent purpose, I pull George's words from my memory, and chuckle a bit. It's not a story that puts me in the greatest light, but I think it's accurate enough to keep as a memory, as a humbling moment, from the mouth of a comics veteran. Knowledge passed on. "Shut up! Shut up! You talk and talk but you never say anything!" Thanks for the response, Jim! I suppose the mob ruled then, eh? I find that quite interesting given that I believe colourists have a major impact on defining a character. I mean, we recognize blue and red as Superman, light-blue is the uniform colour for the Fantastic Four – and has been for decades, etc. I would assume the writer or penciler would have a say in what colours the characters are supposed to wear – but is that always the case? Obviously though, there are identifiable black and white comics, much like those Superman syndicated strips which require no colour to identify the person. Argh! I cannot imagine the philosophies you would have had argued to you as an EiC! That Spider-man bachelor party script reminds me of the Fantastic Four Roast. A one-shot anniversary book that I LOVED as a little kid. And the jokes in the script presented have a similar lovable corniness, so I wonder if it was written by Fred Hembeck? Also, if you ever want to share the story of the Roast, I'd be very happy to hear it! Is there any story behind Marvel's foray into doing comic books for Mattel's Masters of the Universe? DC did the original MOTU comic book series in 1982 and even had He-Man team up with Superman. 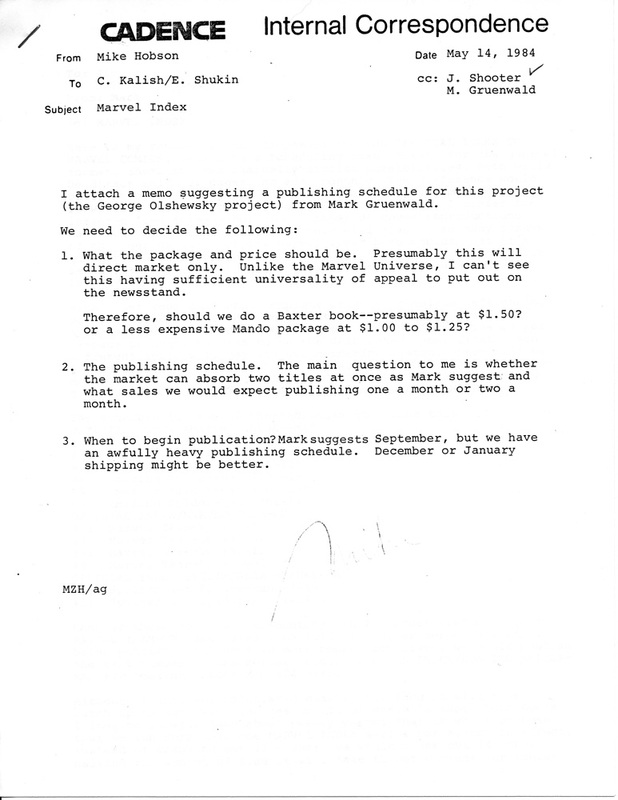 But 4 years later, in 1986, Marvel did 13 issues of Masters of the Universe under the "Star" imprint. There were also a lot of comics produced and packed in with Mattel's action figures during these years. Did Marvel do any of those comics? 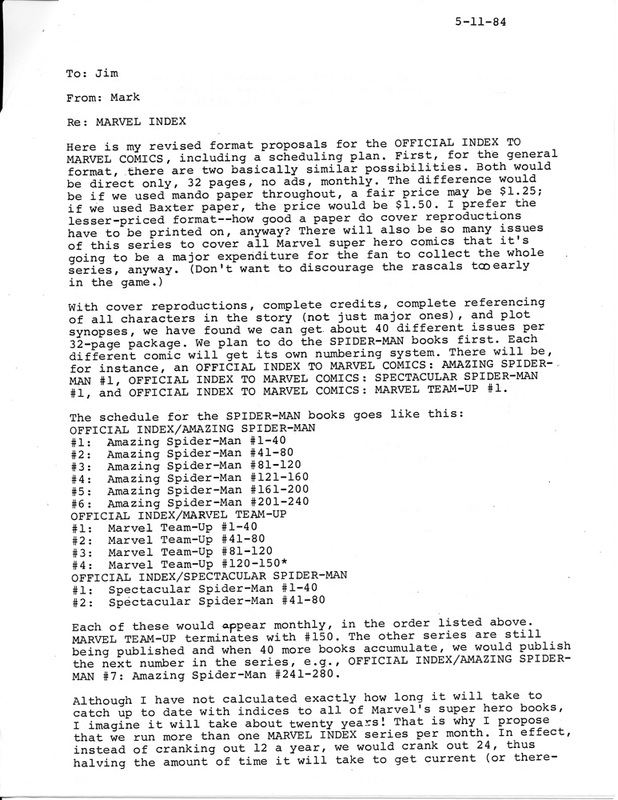 I'm also wondering if there were any toy companies that wanted their licenses published by Marvel but that you turned away for whatever reason. I would imagine that any company would have preferred that Marvel rather than another company do their tie-in comics due to Marvel's greater market share. Yet MOTU was done by DC first. I can also think of one other popular toy line, M.A.S.K. (sort of a G.I. Joe/Transformers hybrid by Kenner) that had a tie-in comic published by D.C. in 1985 (with 13 issues eventually published in total). Incidentally, if you ever wondered what it'd be like if R2-D2 made a cameo in Beach Blanket Bingo, the cover to M.A.S.K. Volume 2, Issue 8 has your answer. 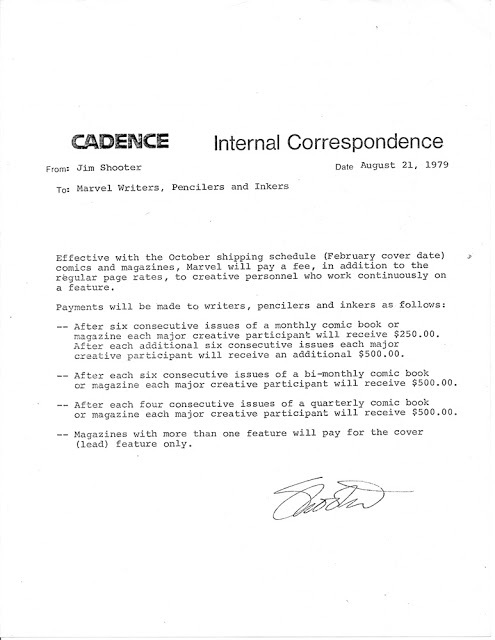 Colorists and letterers weren't included in the royalty plan either. There was no problem keeping colorists on books steadily, and the general opinion was that they didn't have impact on sales comparable to writers and artists. After I installed the royalty plan, I tried to expand it to include colorists. The top brass upstairs thought the royalty pool was big enough (it was) but if I chose to divide it up differently, they were okay with that. I took a poll. Every writer and artist I asked was dead set against including colorists if it meant giving up even a tiny fraction of their royalties — except Chris Claremont, who already gave a small share of his X-Men royalties to colorist Glynis Oliver and letterer Tom Orzechowski. 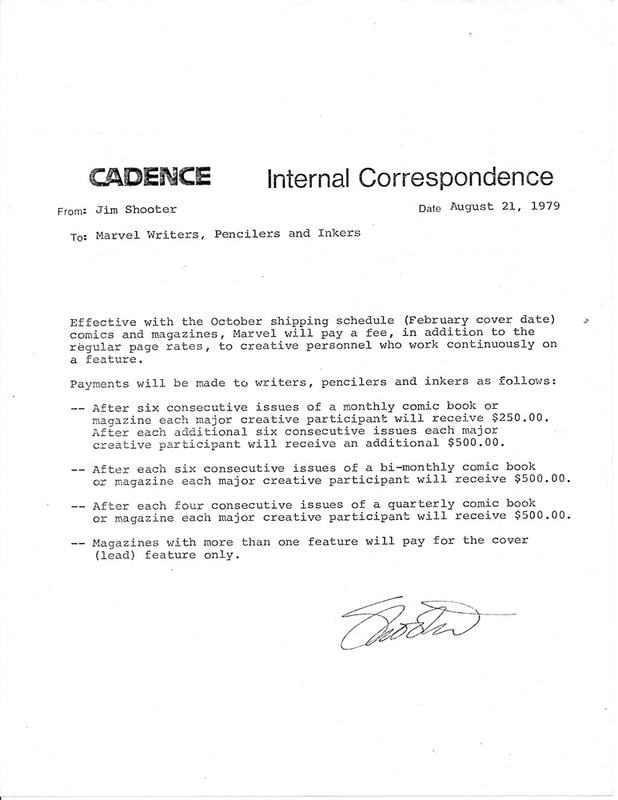 I did raise coloring and lettering rates substantially, however, and even gave contracts to some colorists. Contract people had somewhat better benefits than freelancers — paid vacation, for one. The Continuity Bonus plan seemed to exclude colourists. Why is that? And as always, thank you for this excellent blog. I read it daily and soak in everything you say. I think "Sparkman" was the working name before Bob did his thing. Too bad, I kind of like Sparkman. According to TFwiki.net, "Sparkman" was a proposed name for the Hasbro character (and "Flash Beam" was also considered). The original Japanese toy was called "Astro Magnum" and released by a company called ToyCo. I was wondering if you could clarify a bit with "Shockwave". Was his original name to be "Sparkman"? That would have been a rad toy for me to have growing up. Byrne was clearly joking when he said, "Whoever has the most toys…." Isn't that a George Carlin line? People were talking about the value of a life, what has meaning, what doesn't, what happens when you die, etc. I didn't mean for the comment to be taken in some negative way. I'm willing to see that the "toys" comment wasn't to be taken seriously by Byrne. Hey Dave, Us oldtimers love having that paper. 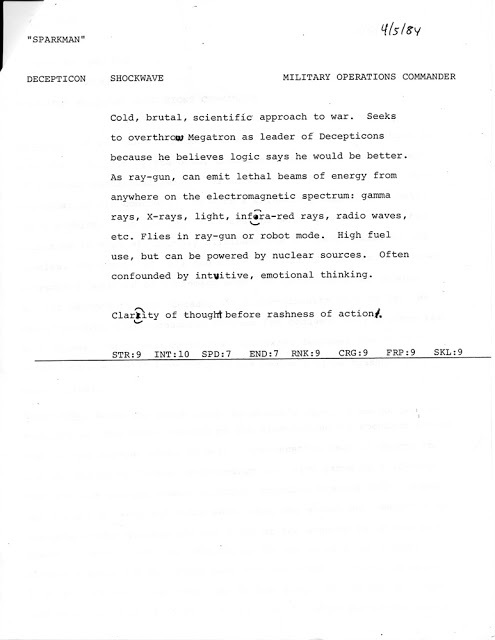 Even now, when I scan a document i make a copy as well. First of all, thanks for the Shockwave profile. Love anything Transformers. Secondly, I'm continually struck that in the days before e-mail, there must have been paper EVERYWHERE. So glad I work in the computer age. So good to hear that People with experience help others that lack it in the comics industry. 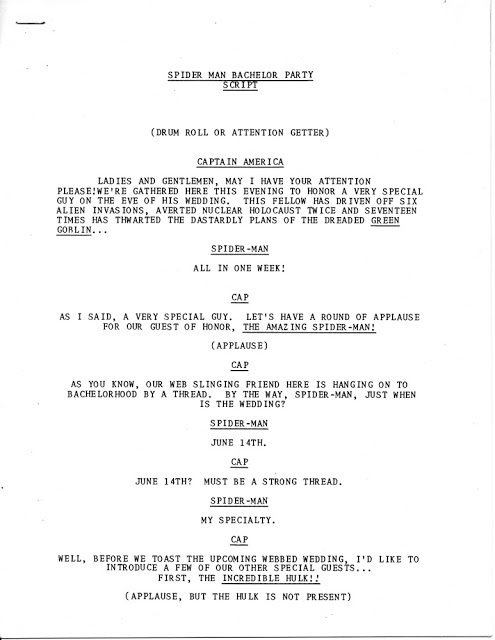 I guess there was no way Marvel was gonna assist the Image guys. I actually don't have a specific comment about Image, we tried to help as much as we could, but I can tell you this… when we started VALIANT we got helpful information from people like Neal Adams and his studio, specifically info about his blueline process. People were generous with their time and information and we always tried to pay that forward and do likewise with anyone else. We helped Image, later on Milestone Comics and anyone else who asked in any way we could. I believe, as Jim does, that improving the business is good for everyone. I spent plenty of time talking to George in that closet office of his. He may not have liked sitting around with other people, but once you walked into that hovel he chewed my ear off good. I loved working with him. Another thing about George. He commuted into the office from Long Island. In order to keep up appearances, he carried a bulky briefcase with him-a symbol of importance I guess. Oftentimes it was empty, but George didn't want anyone thinking he wasn't some important commuter. Funny quirky man. Loved the stories of how he would threaten to sue Jerry Robinson for late payment on some inking job. I remember Lynn quite well, she was my first boss! The Image guys left Marvel after my time. I was busy establishing VALIANT. One of the Image guys called me/VALIANT up to ask about comics production 101 stuff. 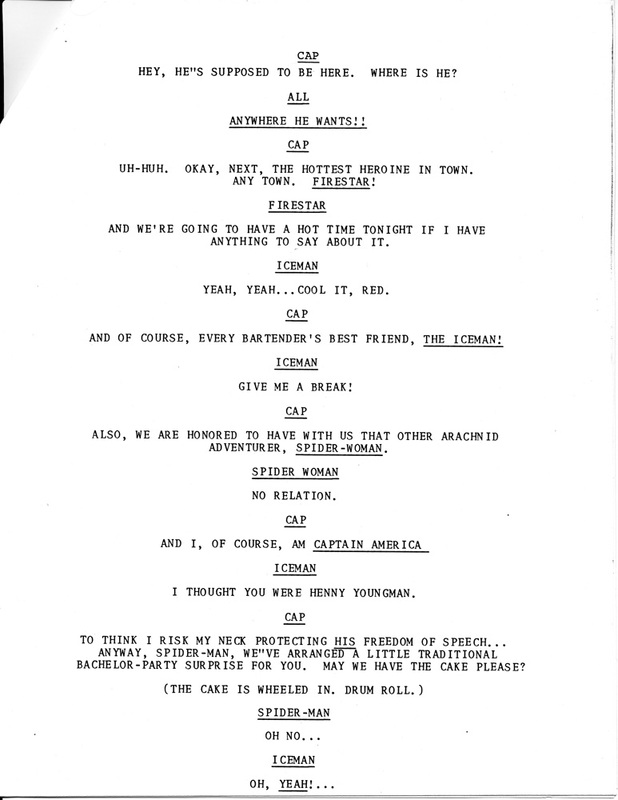 They knew how to do the creative…um…sort of…but had no idea how lettering, for instance, was done. We hooked them up with Chris Eliopoulis and gave them some tips. They did okay, I hear. "I am very pleased to give Lynn my highest recommendation. Lynn worked with me for several years at Marvel Comics, where I was V.P. Editor in Chief. She was my administrative assistant. She gave new meaning to that term. Lynn managed an assistant of her own. She also ran Marvel's robust High School Intern Program, which meant dealing with school system bureaucracy and managing a small herd of interns. She set up a system that turned those kids into an efficient part of the operation, an effective labor force. They did all the photocopying, gofer-ing and grunt work, but she saw to it that they also had ample opportunity to learn and grow. They worked with editors, writers, artists and production people. Several went on to become successful creative professionals. All of them loved it. Lynn (or her assistant) performed secretarial duties for me, of course, but that was a minor part of the job. She spent much more time doing project management work. For instance, I asked her to organize a party for several thousand guests in San Diego, 3,000 miles away. She arranged everything over the phone. Not only was the party successful, it was the hit of the show, the San Diego Comicon. Executives from our competitors' companies who were hosting parties the same night showed up at our party early in the evening because no one was at their parties and everyone was at ours. 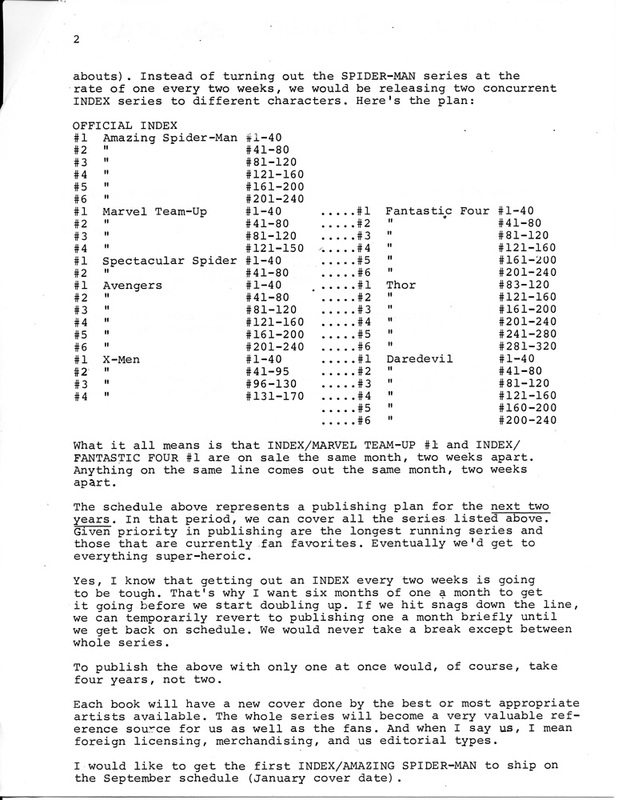 Lynn developed and managed a Marvel tour program. She worked closely with the Make-A-Wish Foundation. And everyone else we dealt with. She effortlessly and effectively executed any mad scheme I threw at her. "Lynn, I want choir robes, candles and song books for the editorial staff. We're going to Christnmas carol corporate." "Lynn, I need you to hire an airplane to fly a banner…"
"Lynn, rent tuxedos for the editors and arrange a visit to the penguin cage at the zoo…"
"Lynn, I'd like a Dixieland marching band…"
"Lynn, can you find me a case of spray snow? Yes, I know it's July…"
Marvel Comics was a wildly creative, outrageous and exciting place back in those days. That only works if there is organization underneath. Lynn laid down much of the organizational bedrock that freed editors, art department and production people to focus on what only they could do. She helped me run a division that published 75 comics and two dozen magazines a month, plus trade paperbacks, posters and what have you. And she did it with rare excellence. I had a total of six administrative assistants during my 12-year tenure at Marvel. 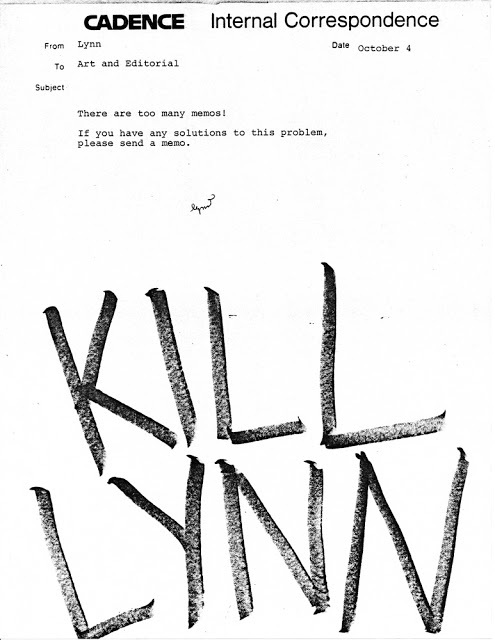 Lynn was the best. X-Factor wasn't an idea Chris Claremont particularly liked, and Ann Nocenti, as I recall wasn't fond of it. Many people pitched X-Men spin-offs, and I was under constant, heavy pressure from upstairs to do more X-Men titles. I caved in because X-Factor seemed to a reasonable X-Men spinoff that wouldn't interfere with X-Men much. Chris mellowed about the book once people he was more simpatico with were working on it. I don't remember much about the bachelor party script. JayJay is pretty sure I wrote it because, she says, the lame jokes sound like something I would write. I dunno. JayJay nailed George's office, except that she made it seem more spacious than it was. 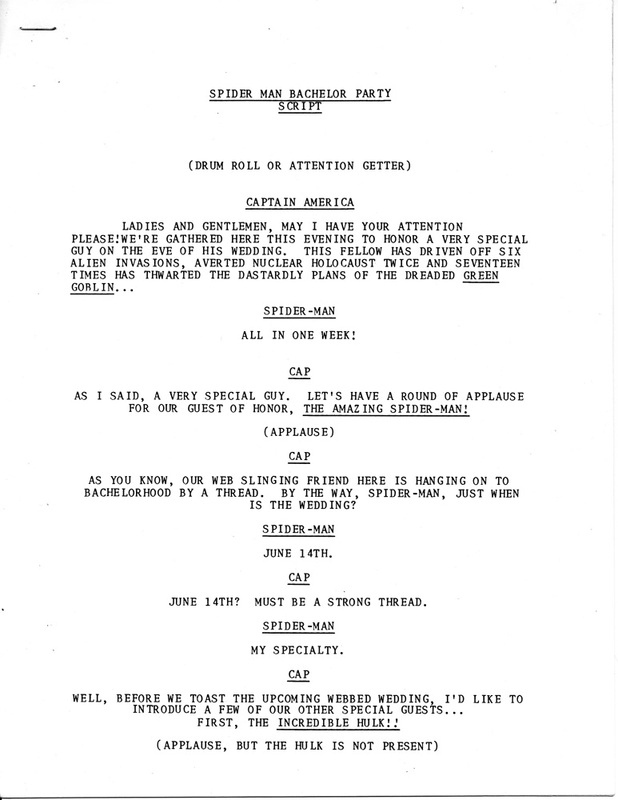 "Sometime I'll tell the story of the first Captain America TV movie. 1978? 1979?" I've been looking forward to that ever since. You must also have stories about the Dr. Strange tv movie. How about those for subjects? i know this is off topic but iam curious if jim was around for the departure of the image guys or he any info of the subject? The original X-Factor was my favorite mutant book ever. I hadn't read the Claremont/Byrne/Austin stuff, so my mutant reading at the time was only the Claremont/Romita Jr./Green stuff, which I liked at the time, and grew to love as time went by. Layton writing it instantly drew me in because I was a big fan of his Iron Man contributions, and Guice was one of my favorite artists. It didn't crush me quite as much as Byrne leaving the Hulk, which happened just before, but Layton, and then Guice leaving X-Factor was a huge blow, but it was saved by Weezie and Walt, who did every bit as good, and probably better! I always wondered why Layton left. 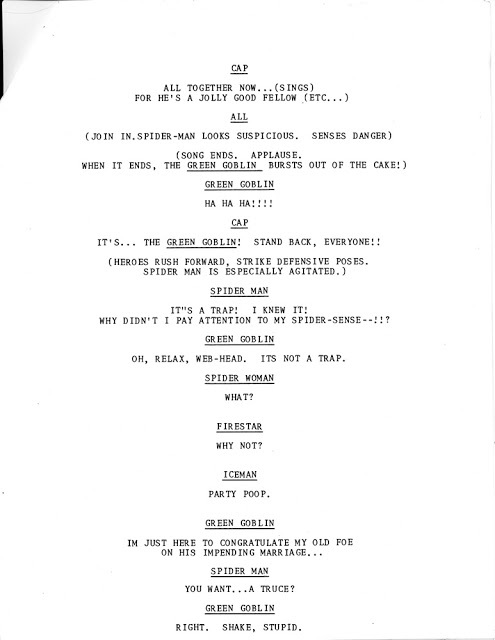 He was really gung-ho about doing the series, and had quite a few plans, and by issue 6 he was gone. The star was done with the magic of the "Star Tool" in Adobe Illustrator. I designed my work layout for efficiency and as much isolation as I can get. Someone always tries to improve it and make my job more difficult. Since I took the job I'm doing now I've only moved once. I see some people who have moved a dozen times in the same time period… sheesh. George Roussos' description of Stan Lee reminds me of what Kirby said about Lee in the 40s: "Even as a young boy, he'd be hopping around — I think he had a flute, and he was playing on his flute." I didn't grow up in an orphanage, but I can appreciate Roussos' desire for privacy. I'd like to know more about Roussos' background. Can anyone here recommend an interview or biographical article? 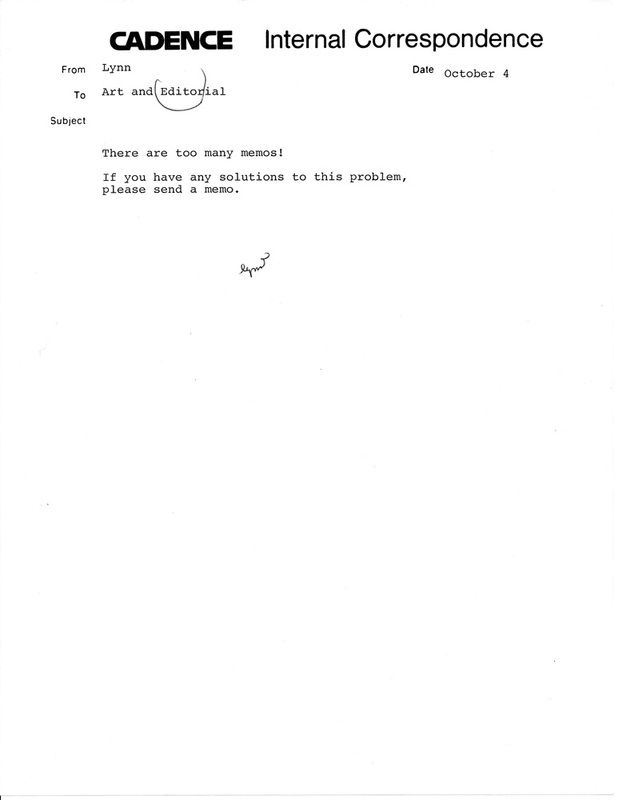 Thanks for the memos. A shame all the projected indexes didn't materialize. I might have bought many of them. I suppose the indexes that were released didn't sell well enough to support the original plan. Is the "Lynn" who wrote the memo about memos Lynn Cohen? 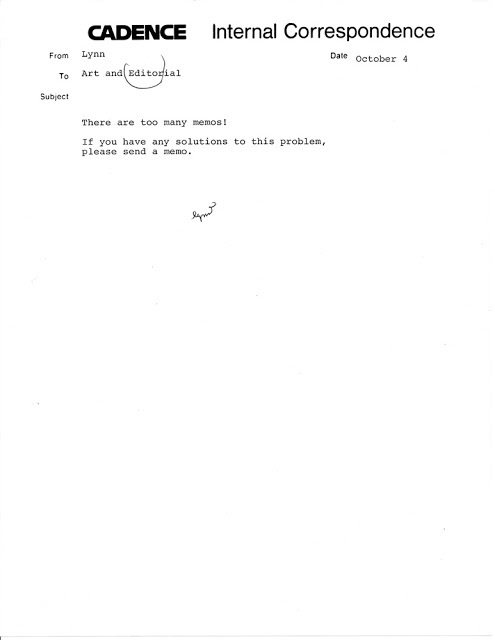 One can imagine the modern-day email equivalent of the anonymous response with some huge font. I wish I could dig up Shockwave's published bio and stats to compare them with Bob Budiansky's typescript. So glad Shockwave wasn't called "Sparkman" which must've always been intended to be a placeholder since it's so unlike the other Transformers' names. 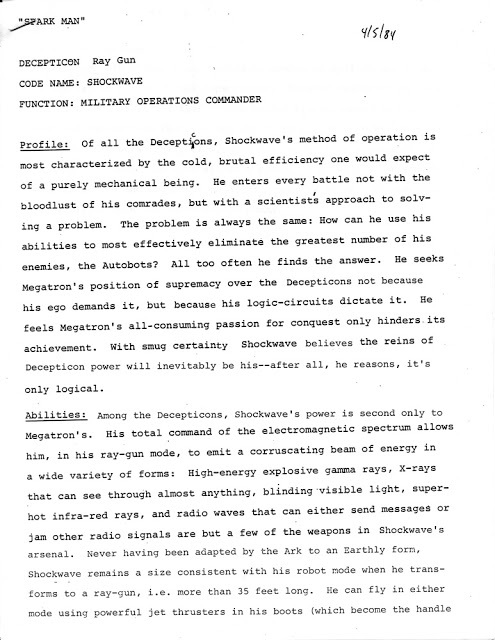 I'm surprised this bio was written so soon before Shockwave debuted in the first episode of the Transformers cartoon on September 17, 1984. tfwiki.net says Shockwave was "referred to as Flash Beam" in the script for that debut episode. 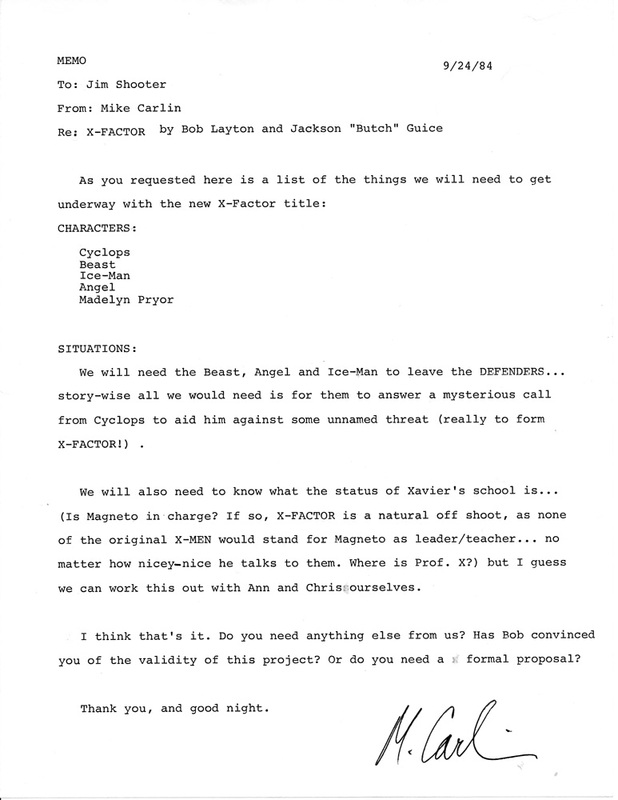 Ah, confirmation that Madelyne Pryor would have been the fifth member of X-Factor! It would have been interesting to have a civilian newbie in place of deceased veteran Jean Grey. I always thought it was odd that X-Factor didn't come from the Claremont/Nocenti stable. I wonder if other creators pitched their own X-spinoffs. Was Claremont OK with handing over Scott Summers and Madelyne or Jean to others? 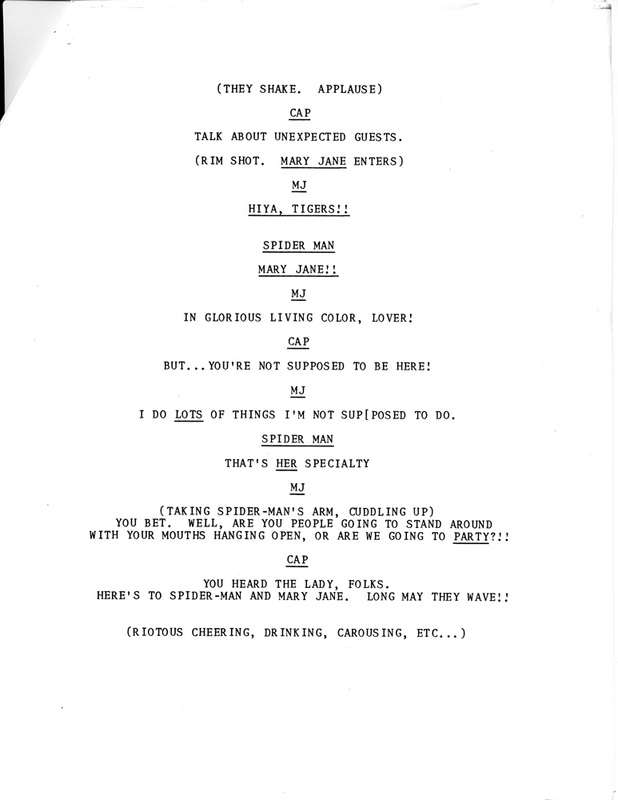 Was the bachelor party script actually acted out, and if so, do you remember where? I'm amazed you can remember the layout of Roussos' office after so many years! I'm having trouble remembering the layouts of the places I've lived in less than two years ago. How did you draw the star?